Three years ago, Tami had an idea … why not start a blog? What a great way to document all of the creative projects we are working on. When she brought this idea to Lauren, her response was simple. All she said was, “No way! I don’t like to write.” Of course, with Tami’s background in teaching she didn’t mind putting their thoughts into words … and a blog was born. Now, three years later, it was time to make some changes to our baby blog and create a more sophisticated and classy environment for it to live. Hiring a web designer and giving our site a whole new look that really captures who we are as bloggers and our brand was the best decision we ever made. 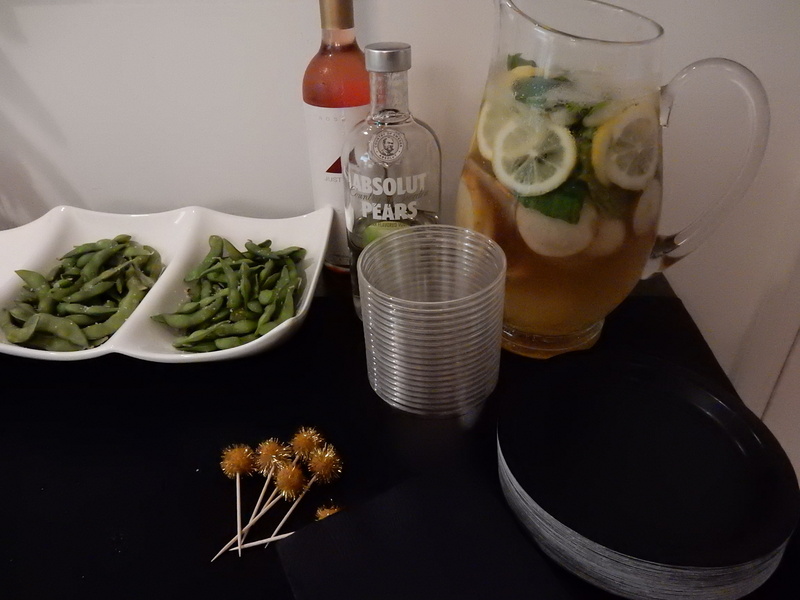 So of course, the next logical step was to throw a party. We invited our Craft Club girls, our sponsors, and other friends who have supported us along the way to celebrate our blog’s third birthday and the launch of our new website. We decided to make the look of the party match the colors and overall feel of our website (adding in pops of gold foil to a mostly black and white background). Although the look was a bit formal, the mood was kept light and we love how it all turned out. Appreciation is best shown with food, right? 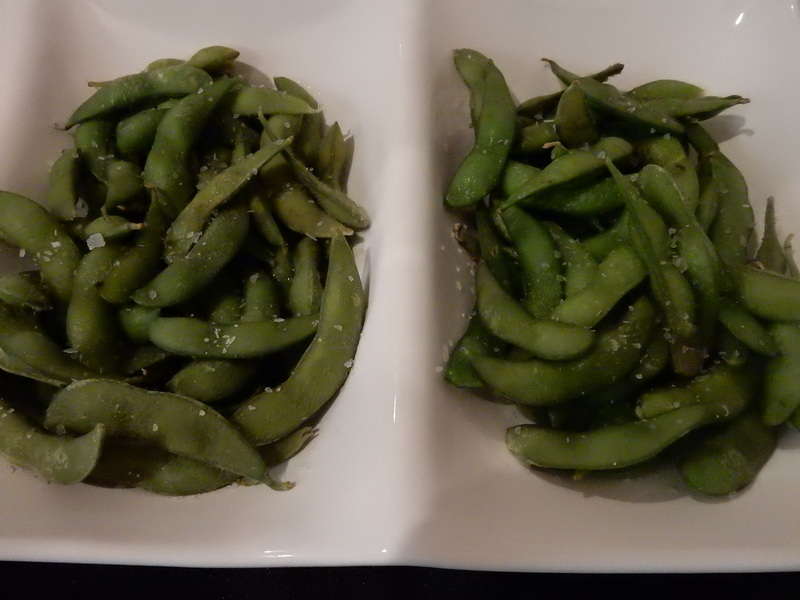 Our menu consisted of sushi from one of our favorite local spots, edamame, homemade Asian meatballs, and an Asian pear cocktail (recipe coming soon on a Food Fridays post). 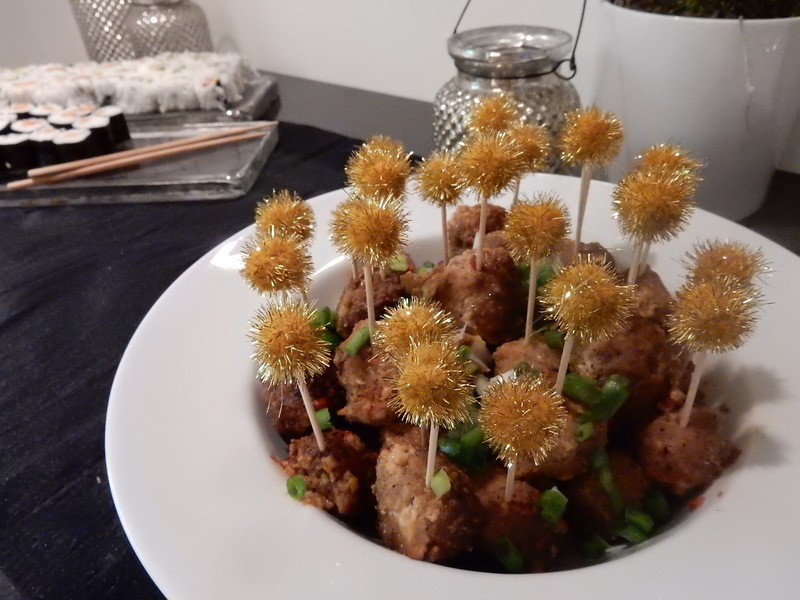 Gold sparkly poms were added to the toothpicks for a fun touch. 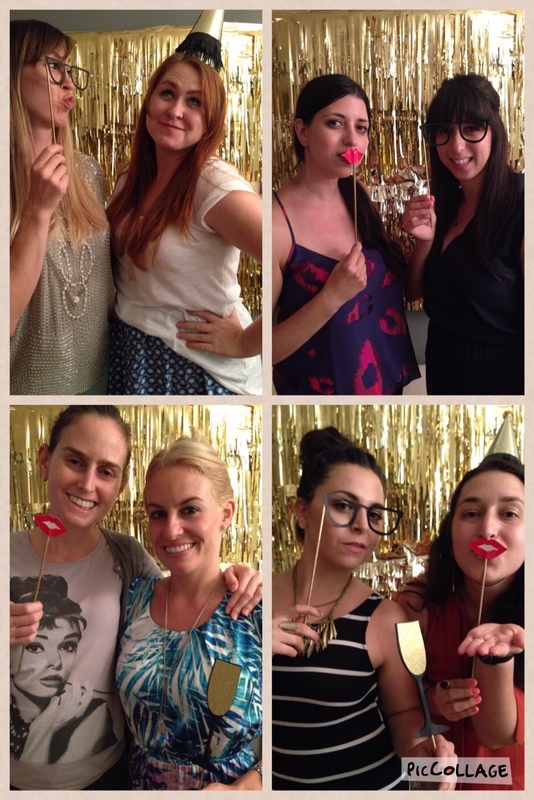 Our “selfie booth” from Darci’s Gold, Glitz, and Glamour bachelorette party made a come back at this event! 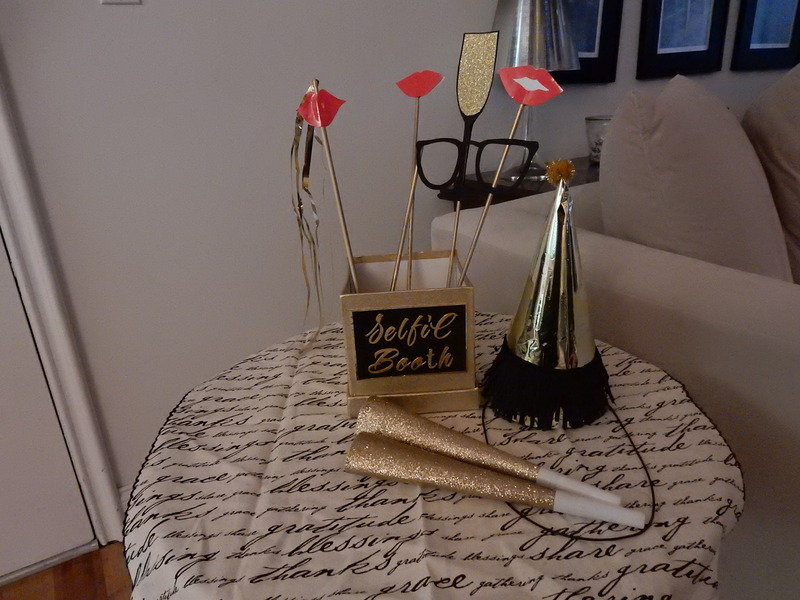 We added a few more homemade props (like this gold foil party hat) to make it festive. Love all the sisters taking selfies in our photo booth! 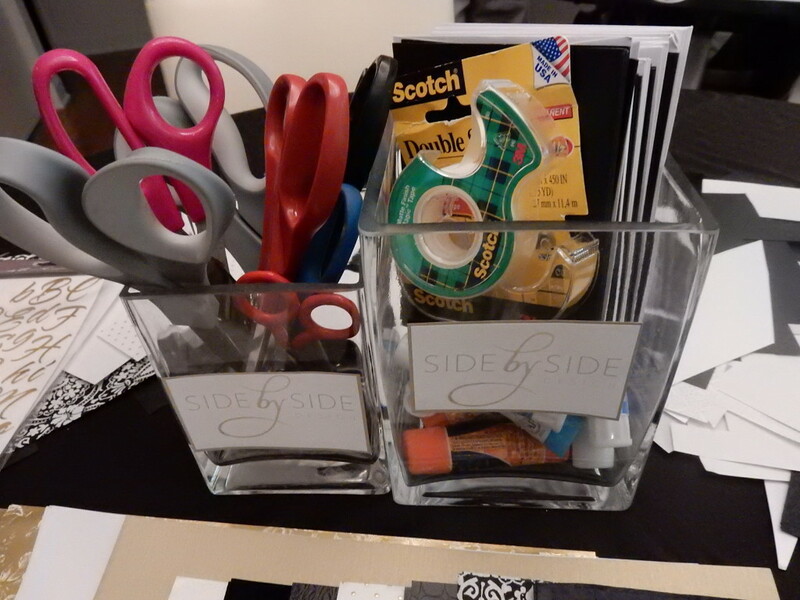 After streaming our new website through Apple TV (giving all the girls a chance to take a peek) and thanking them for their support, we moved over to the craft table. Birthday card supplies kept with the party’s theme and made it so that our guests had a few cards to take home to use when in a pinch for time. 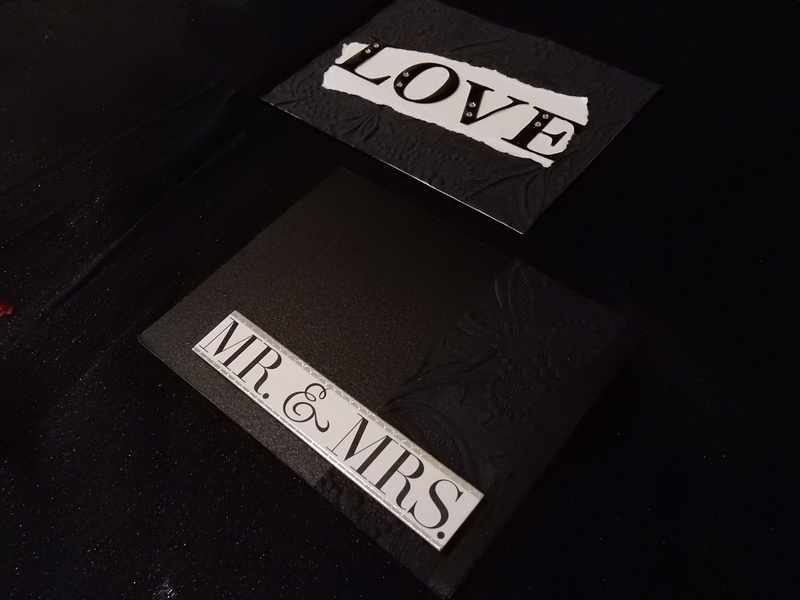 We bought fancy blank cards as the base and our guests added specialty paper, lace, and rhinestones to personalize each one. Lauren created this card for her sister-in-law’s wedding this weekend. 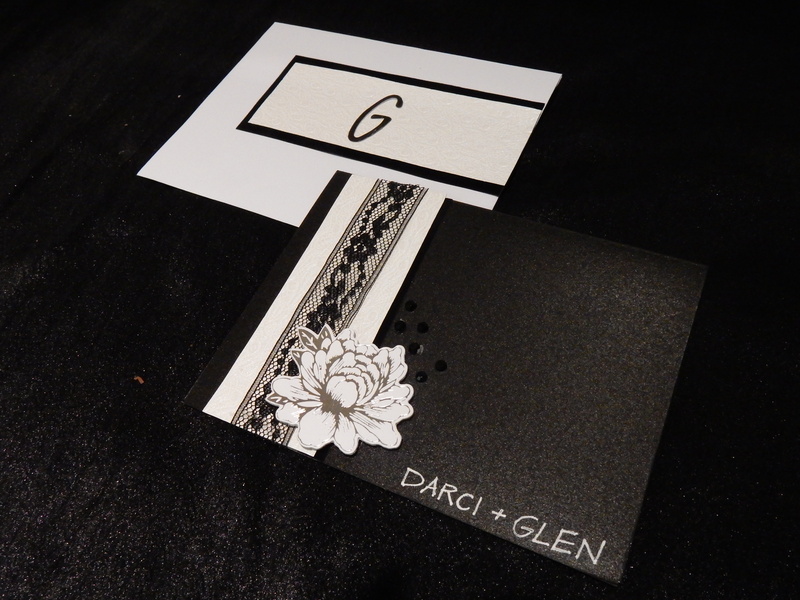 Tami also created a wedding card for Darci and Glen as well as a few others to have in her collection. 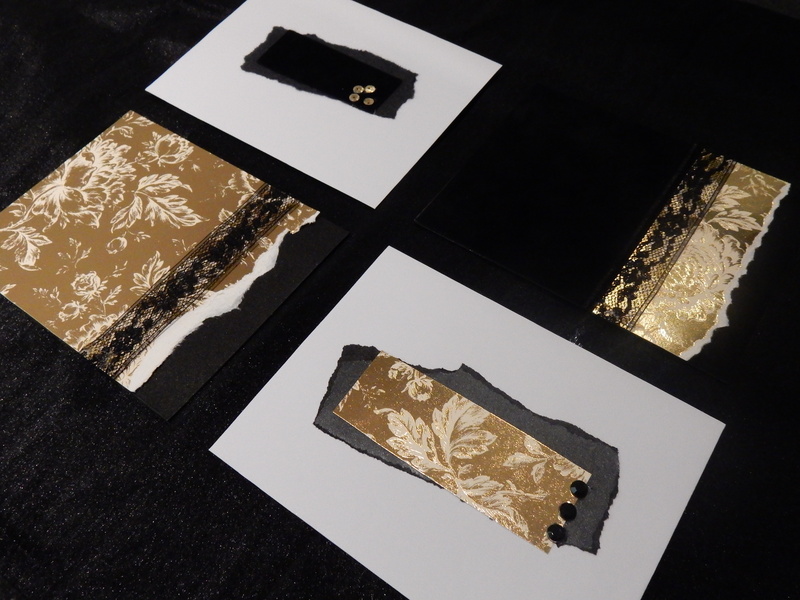 Gold foil paper really made each card fancy while a torn edge keeps them a bit casual. For dessert, we provided different types of chocolate for our guests. We sent them home with something sweet as well. Each adorable bag was filled with our favorite Hershey’s Nuggets and a personalized thank you for each girl’s support. Thank you to all of our readers for keeping us going and giving us feedback over the past three years! Keep reading! Keep letting us know what you like and what we can improve upon. Here’s to many more years of creating, coordinating, and collaborating . Happy birthday to our beloved blog … Side by Side Design! This past Friday was a huge day for Side by Side Design! Not only did we launch the blog section of our brand new website and celebrate three years of blogging, but our younger sister, Rebecca went into labor. Our adorable nephew was born early Saturday morning. We guess it goes without saying that as much as you can plan out every last detail of your life, sometimes things do not go as planned. With all of the excitement, we feel as if we may not have given the correct amount of attention to the amazing-ness that is our website designer, Kristin B., our blog’s fabulous new layout, and how excited we are to be unveiling the new branding of our business. We honestly can’t wait for the rest of our website to follow in the next month and for our readers to see just how dedicated we have been to creating one cohesive look for our brand. Possibly the feature on our blog that we are most excited for is our new comments section. This is something that has been a focus for us all along (allowing our readers to provide us with feedback as well as creating a space for dialogue about various creative projects and topics). However, on our previous site, our comments section was never quite what we hoped it to be. Often times it didn’t work at all … can anyone relate? Now that our site has been revamped, our comments section is up and running and better than ever! Here’s where you come in … we probably shouldn’t admit this, but we are dying for a little love on our blog. We would love to hear your feedback. What types of posts do you enjoy? What could we be doing more / less of? What do you think about our new look? We really value your opinion! 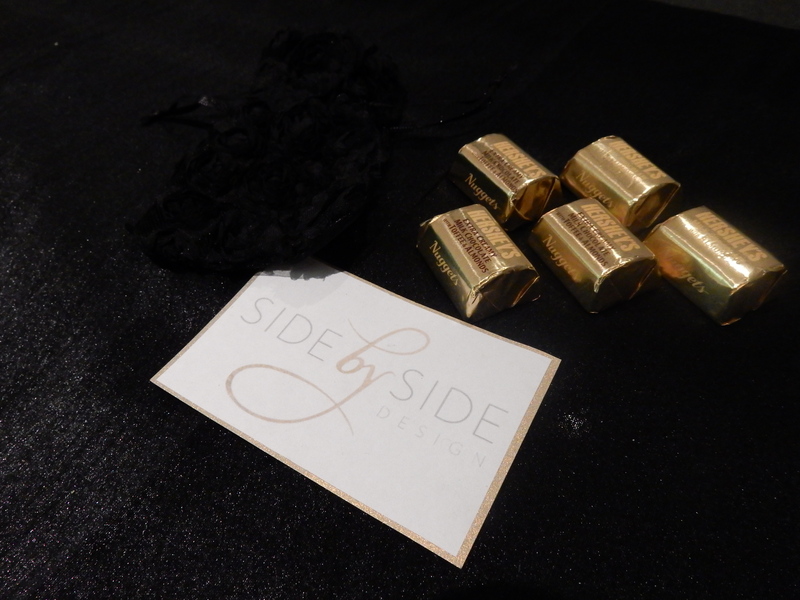 Happy 3rd birthday to Side by Side Design (a little late, but better late than never)! Oh yeah, and looking better than ever!! Our new Cookbook Club will follow the same structure as the Craft Club we started a few years back. It will take place once a month and each month one of the girls will host it in their home. In contemplating how we would go about posting on this topic each month, we decided that it would be great to have a different girl post each month. Each girl will provide their own perspective; their hosting tips, how they chose the month’s cookbook, the process by which they made their dish, etc. Also, as many of our very creative friends are bloggers themselves, this will allow us all to show support on each other’s blogs. A way to show how girls from many different career paths can get together and put their cooking skills to work. This first official Cookbook Club meeting was hosted by our friend Paige (a fashion designer and mother of two who also started the club). In this post, she will provide you the details for how this club came to be and the process by which she prepared to get everyone together. I have this awesome group of friends with whom I craft. We get together about once a month and make things. 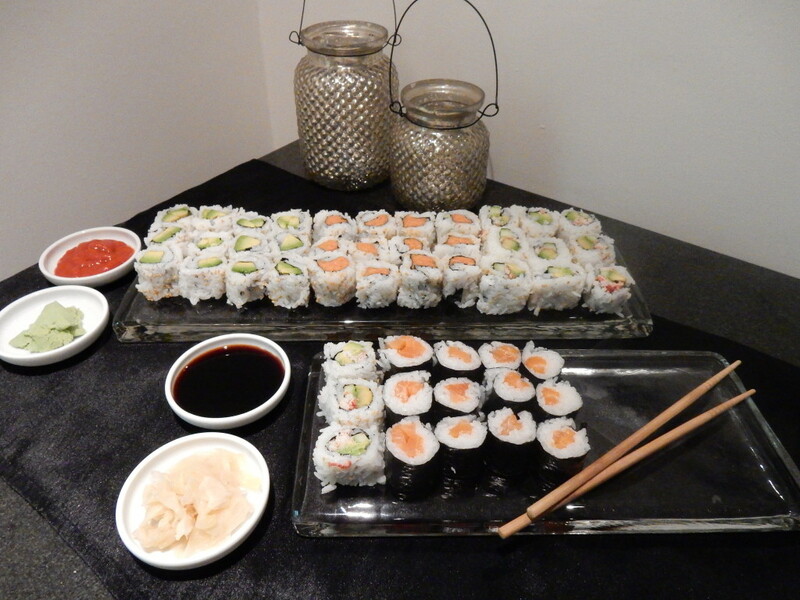 We rotate hosting at our homes. Sometimes there’s a theme, such as a holiday. Sometimes, it’s just a bring-your-own-project situation where you can have time and space to craft, catch up with friends, and eat some tasty snacks. I could go on and on about how much I love me some craft club, but I will save it for now. 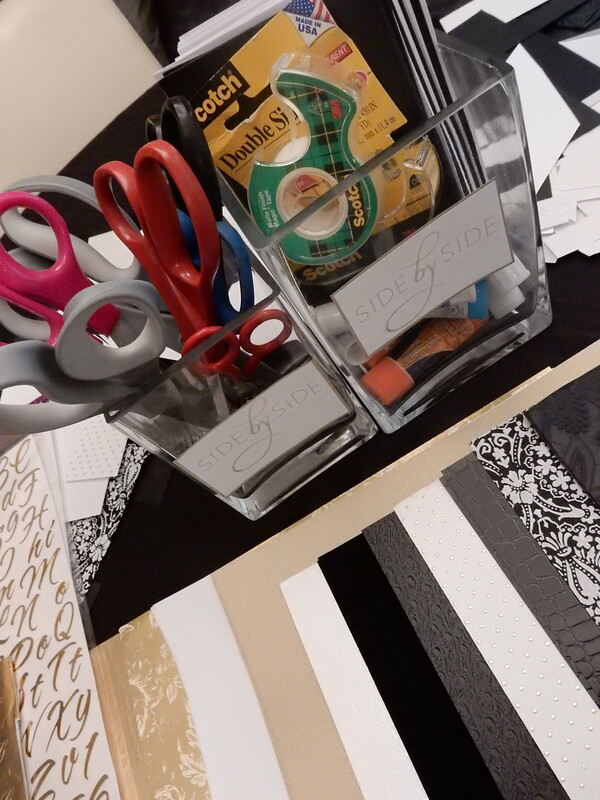 You will definitely be hearing more from me about our craft club in the future! So when I came across this brilliant idea for a cookbook club, I knew the first place I would turn to would be my inspiring crafty friends. The idea is pretty simple. Just like a regular book club, you choose one book for everyone to read and then plan a meeting where you all get together to talk about the book. Only being that it’s a cookbook, everyone must cook and bring their recipe to a dinner party. 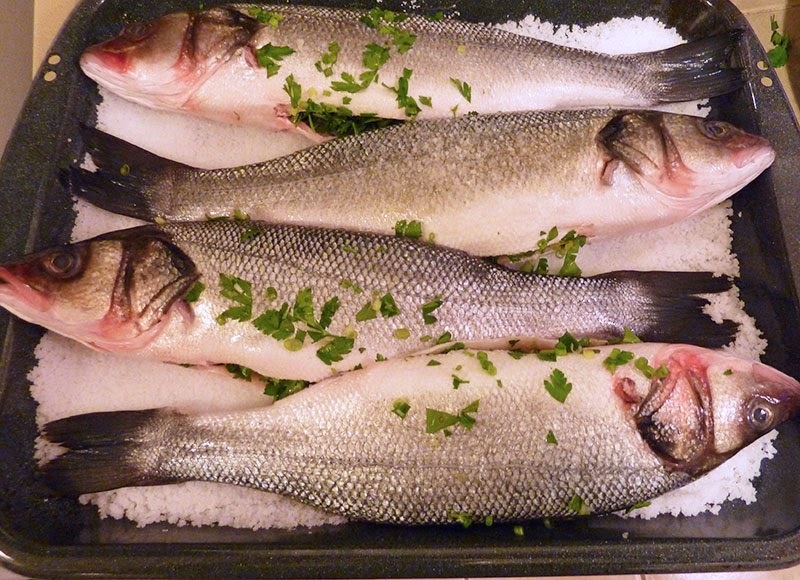 Food, cooking, friends (and not too much reading) – yes please! 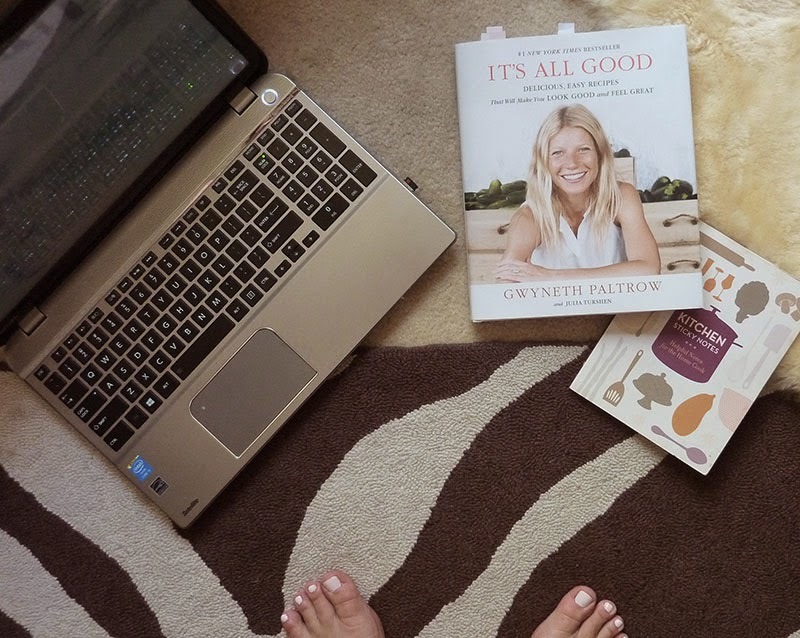 To make it easier for everyone and since I was spearheading this project, I chose the book It’s All Good by Gwyneth Paltrow. I know Gwyneth is a controversial celebrity – people either love her or hate her – but I, for one, am a fan. After all, she’s just another mama trying to make it all work in this world, right? Ok, that’s all I’m going to say on that subject for now. Since not everyone wanted to commit to purchasing the book, I offered to email recipes to people. I helped narrow it down by giving a synopsis of what was in the book and made several recipe suggestions. Then everyone emailed me back what they wanted to make to be sure we didn’t have any duplicates. 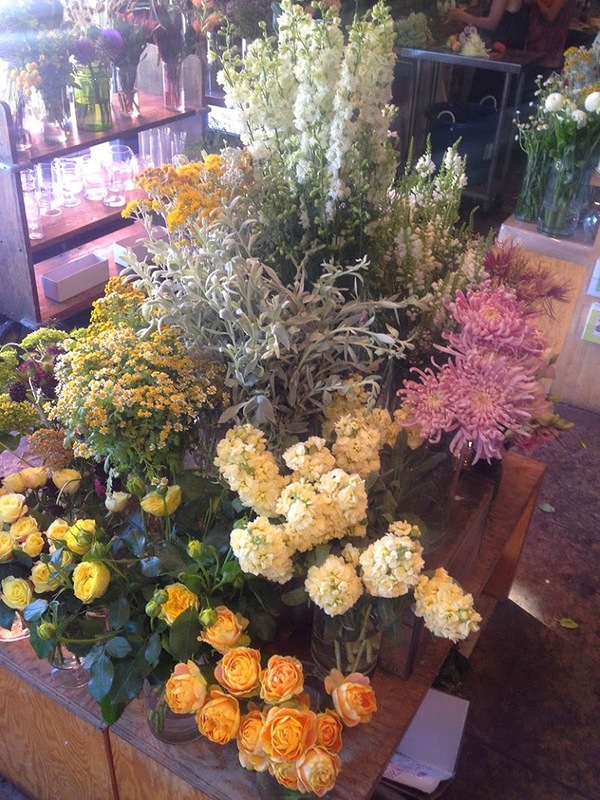 I stopped at this lovely little flower shop in Silverlake called Clementine on my way home from work to get something for the table. I usually prefer to go to the flower market in downtown when I have the time, but Clementine is a super cute, affordable option when time is not on my side. I told them how much I wanted to spend and what it was for and they whipped me up a little bouquet in a minute! After reading this, you surely want to start a Cookbook Club of your own! Come on it’ll be easy! We’ll even tell you what books or publications to use each month! 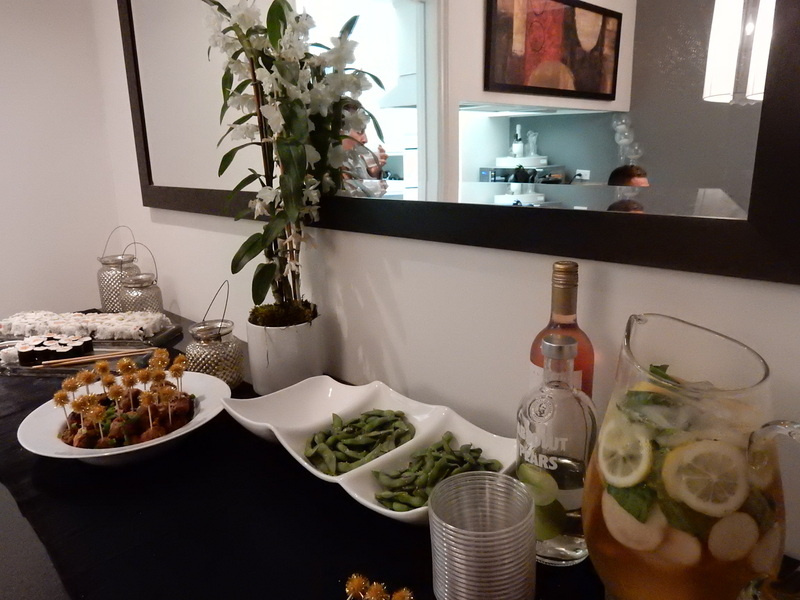 Then we can all talk about the yummy new recipes we tried. Are you so excited? We are! Our brand new comments section will be up and running on our new website later today. Each month, we will be hosting a dialogue on the different recipes (which ones you liked, which ones can be tweaked, how to create a complete meal, etc. ), and we will announce the next cookbook for the coming month. This should give you ample time to buy it, get your friends together, and sample tasty foods. We are already looking forward to next month’s meeting where we will be creating dishes from the August issue of Cooking Light. Quick, go get yours and join us! We must start out by saying that as we are writing this post we are anxiously awaiting the arrival of our new little nephew. In fact, it is very possible that by the time you are reading these words we will finally have met him. Well, we can hope anyway, and we know our sister Rebecca and her husband are more than ready for him to be born. In any case, putting together a nursery is a very personal and exciting time for any new parents-to-be. They must decide (and agree) on a color scheme, a theme, and a feeling that they want the room to have for their new little one. All this is almost always done before a couple ever even meets their child and before they know what type of personality he or she may possess. They research top brands in furniture and other necessary items and then pray that their shower guests spring for the things on their registry. Meanwhile they are preparing themselves mentally for being parents and all of the changes that this will bring to their lives. Luckily this particular couple did not have to do any of this alone. As Rebecca’s older sisters (and Lauren being a new mom herself), it has been our pleasure to help out in any way we can. 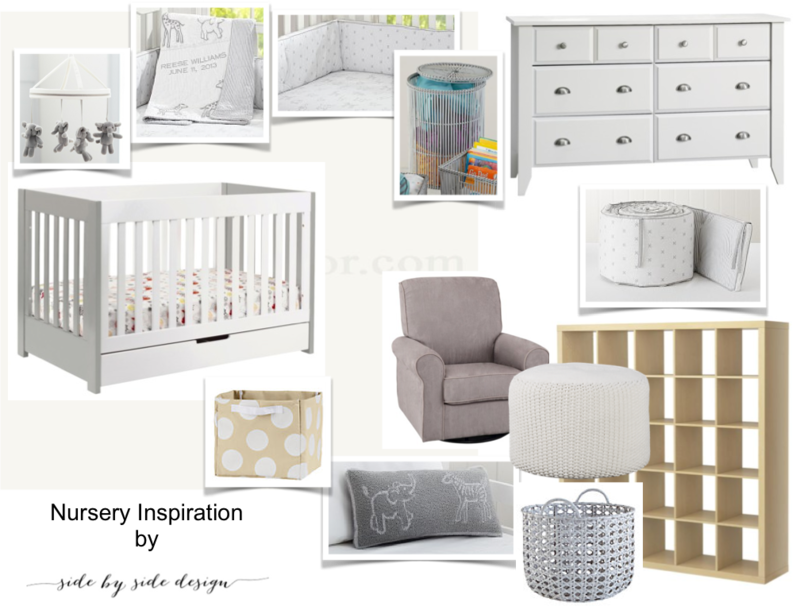 We worked together with Rebecca to create a look for their nursery space; making an inspiration board for the pieces that worked well together and then placing the required items and things that coordinate on their registry list. The decisions were easy; keep the palette neutral, bright, and happy, make the space functional and cozy, and include plenty of storage for lots of toys, clothing, and anything else a baby boy might need while keeping the costs down. Rebecca had one more small request. She wanted to incorporate baby zoo animals into the design without making the room too “cutesy”. We are really happy with how the room turned out. This is another one of those projects that goes to show it’s not about how much money you spend, it’s how you put it all together. The bookcase (which Rebecca has had for a while) is from Ikea and proved to be the perfect place to display all kinds of fun children’s books, toys, and memorabilia (both old and new). The crib, dresser, and glider were all purchased at Target and the fun baskets were found at Land of Nod. The bedding and mobile is truly what makes this space adorable and were purchased at Pottery Barn Kids. Many other special gifts were used as wall decor to brighten up the space just a bit, including the paper bunting we made for Rebecca’s Baby Shower. We are so excited to meet our new little nephew and know that he will truly be a blessing for his mom and dad as well as the rest of our family. Congratulations to our sister and brother-in-law on this amazing moment in your lives and the journey you are about to embark upon. Just remember, we are always here to help should you need us. This past weekend, Robyn and Joel (Lauren’s in-laws) celebrated their anniversary. What a great reason to spend time with them in Orange County, go out for a nice dinner, and check in on the progress of the construction on their home. During this particular visit, Lauren was very pleased to see so many changes happening throughout the house and really feels like it is all starting to come together. So much so that she felt the urgent need to share the progress of yet another space with all of you. One of the rooms the couple is most excited about is their master suite. In our previous post, Under Construction: Modern Dream Master Bedroom, we mentioned that Robyn and Joel’s goal was to create a peaceful environment just for them. We already showed you the exciting plans we have for their master bedroom, but we are excited to share now the rest of this special space. 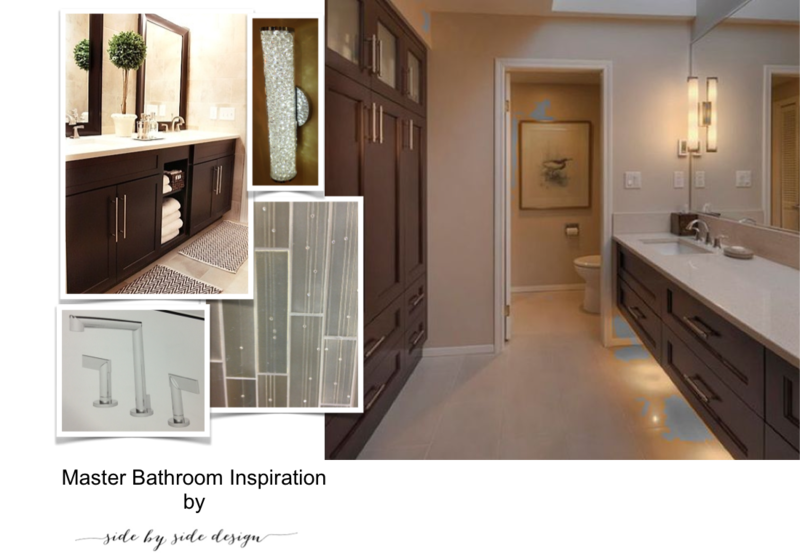 Lots of fun details and a little bit of glamour have been incorporated into the design to complete the master suite of their dreams. As with the master bedroom, it was very important to Robyn and Joel to strategically place the windows so they could really enjoy the view. Everything else in this room was placed almost like a puzzle to use every bit of space to the fullest and create as much storage as possible. As you can see, the room is really starting to come together. All of the cabinetry has been installed and the tile installation will begin next week. Robyn’s closet is attached to the bathroom and Joel has his own closet on the other side of the bedroom. Both of their closets include fun details such as tie and belt racks, built in laundry hampers, locked jewelry storage, and plenty of shoe shelves. The bathroom also has lots of space to store towels and additional clothing. Lauren really wanted to keep the color palette for this space neutral and timeless. They can still introduce color through accessories, towels, or other fun details, but this way she knows her in-law’s will not tire of its look. They kept the cabinetry style simple as well with a craftsman door and modern hardware. All of the walls, the majority of the tile, the countertops, and the cabinetry will be white and the main gray flooring tile found throughout the rest of the house will be in here as well. Some fun, glitzy details such as the subway tile found above and these gorgeous sconces will give this space the elegance it deserves. Robyn fell in love with this tile which has strands of Swarovski crystals. Once Lauren saw it she agreed nothing would compare. As it wasn’t the most costly of choices, they created a design to incorporate the tiles into the backsplash in an interesting way. We can’t wait to see how the finished product turns out. After visiting the house, Lauren was most excited to share this space with all of you. There are so many elements that have already been completed, and the finishing touches are sure to make this space amazing. We still have at least three more “under construction” spaces to share including the office, theater, and craft room (That’s right we said craft room!) … stay tuned.